Josh Brown|Miami Valley Sunday News Milton-Union’s Ally Lyons clears the bar in the high jump at the Miami East Invitational Friday. Josh Brown|Miami Valley Sunday News Miami East’s Justin Brown competes in the long jump at the Miami East Invitational Friday. Josh Brown|Miami Valley Sunday News Covington’s Lauren Christian throws the shot put at the Miami East Invitational Friday. 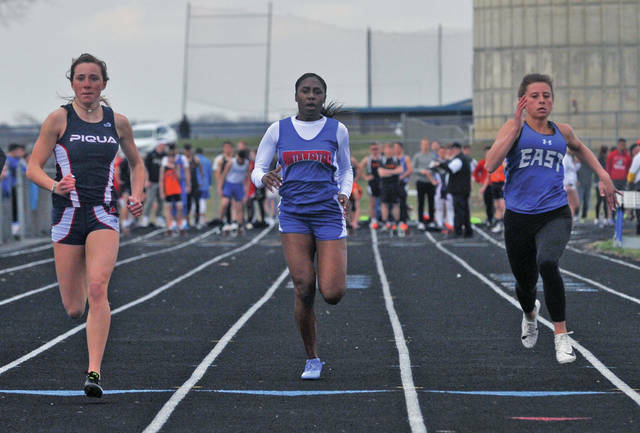 Josh Brown|Miami Valley Sunday News Piqua’s Camilla Nicholas (left) and Miami East’s Gabrielle Hawkins (right) were first and second in the 100 at the Miami East Invitational Friday. 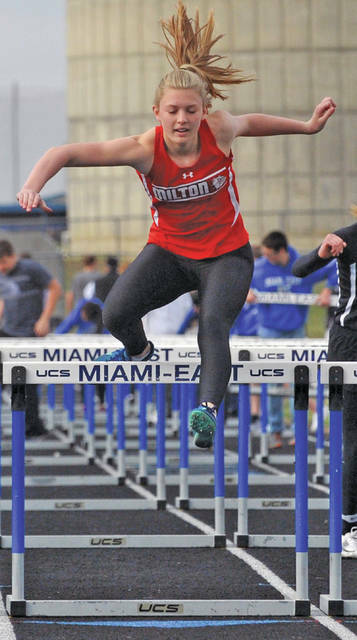 Josh Brown|Miami Valley Sunday News Milton-Union’s Morgan Grudich runs the 100 hurdles at the Miami East Invitational Friday. Josh Brown|Miami Valley Sunday News Miami East’s Amber Kinnison throws the shot put at the Miami East Invitational Friday. Josh Brown|Miami Valley Sunday News Covington’s Kadin Presser competes in the long jump at the Miami East Invitational Friday. 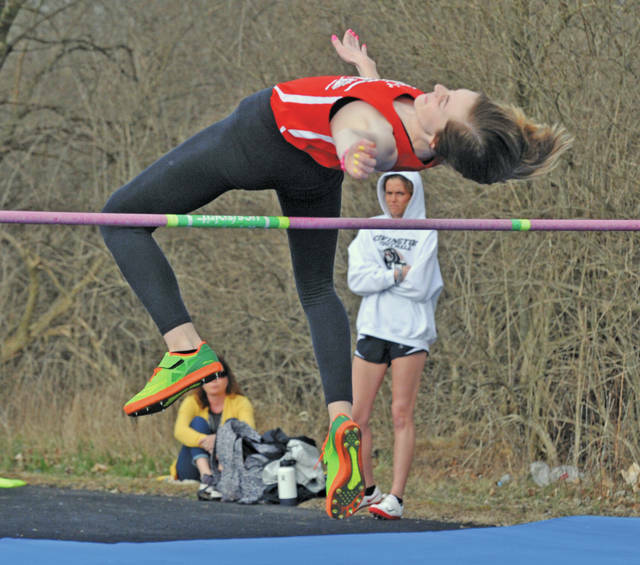 CASSTOWN — Milton-Union’s Ally Lyons capped off a school record-setting week with a victory in the high jump at Friday’s Miami East Invitational track and field meet, helping lead the Bulldog girls to a runner-up finish overall, while the Covington and host Miami East boys and girls teams all posted top-five finishes. Milton-Union’s girls were second with 76 points, finishing behind winner West Liberty-Salem’s 168. Lyons, who cleared 5-2.5 in the high jump earlier in the week to set a new Milton-Union school record, cleared 5-1 to win Friday’s competition. Morgan Grudich won the long jump (16-7.25) and was second in the 100 hurdles (17.35 seconds) and 300 hurdles (51.86 seconds). Kristen Dickison was third in the 800 (2:34.31). And in the relays, the 4×800 team was second (10:34.36) and the 4×200 team was third (1:53.32) and the 4×400 team was fourth (4:34.12). Covington’s girls were fourth with 66.5 points. Lauren Christian doubled in the throws, winning the discus (121-0) and the shot put (36-10.25). Paige Boehringer was second in the 800 (2:33.09) and fourth in the 400 (1:04.98). Morgan Lowe was third in the 200 (27.59 seconds). Lilli Hamilton was tied for third in the high jump (4-9). Morgan Kimmel was third in the 300 hurdles (52.36 seconds) and fourth in the 100 hurdles (17.87 seconds). And in the relays, the 4×400 team was third (4:30.02). Miami East’s girls were fifth with 58 points. Gabrielle Hawkins was second in the 100 (13.19 seconds) and third in the 400 (1:02.47). Liza Bair was tied for third in the high jump (4-9). And in the relays, the 4×200 team was second (1:53.27), the 4×100 team was fourth (54.6 seconds) and the 4×800 team was fourth (11:23.78). Piqua’s girls were sixth with 57 points. Freshman Camilla Nicholas led the way, winning the 100 (12.93 seconds) and the 200 (26.94 seconds) and finishing second in the 400 (1:01.64). Ana Adams was third in the 1,600 (5:45.21). And in the relays, the 4×400 team was second (4:29.46). On the boys side, Covington led the local teams with a third-place finish with 72 points. Ben Logan won with 91.5 points and Northwestern was second with 86. Andrew Cates won the 400 (50.78 seconds) and Kadin Presser was second in the high jump (6-2) and fourth in the long jump (19-1) to lead the Buccaneers. Bennett Welborn was third in the 1,600 (4:50.17). Cade Schmelzer was third in the 300 hurdles (43.88 seconds). Gray Harshbarger was fourth in the 400 (53.08 seconds). And in the relays, the 4×200 team won (1:34.14) and the 4×400 team won (3:37.15). Miami East was fourth with 62 points. Justin Brown won the long jump (21-0.5), was second in the 100 (11.49 seconds) and was third in the high jump (6-2). Quentin Shoemaker was second in the 200 (23.68 seconds) and third in the 100 (11.6 seconds). Aaron Lawrence was third in the 110 hurdles (16.58 seconds). And in the relays, the 4×100 team won (45.44 seconds). Milton-Union was sixth with 47 points. Dalton Hetzler was third in the long jump (19-1.5) Jake Palmisano was fourth in the high jump (4-9). Kyle Hultgren was fourth in the 300 hurdles (45.1 seconds). And in the relays, the 4×800 team won (8:51.11) and the 4×400 team was second (3:42.38). Newton was eighth with 45 points. Dawson Hildebrand was second in the shot put (54-10.25) and fourth in the discus (147-11). Cameron Stine was second in the 110 hurdles (16.48 seconds). Josh Ecklebarger was third in the 200 (24 seconds). Ethan Cook was fourth in the 100 (11.67 seconds). And in the relays, the 4×100 team was fourth (46.15 seconds). Piqua was 10th with 36.5 points. Mitch Fletcher was second in the 800 (2:12.98). Nolan Campbell was third in the 3,200 (10:37.19) and fourth in the 1,600 (4:52.88). Jasiah Medley was fourth in the 200 (24.04 seconds). https://www.dailycall.com/wp-content/uploads/sites/30/2019/04/web1_040519jb_mu_allylyons.jpgJosh Brown|Miami Valley Sunday News Milton-Union’s Ally Lyons clears the bar in the high jump at the Miami East Invitational Friday. 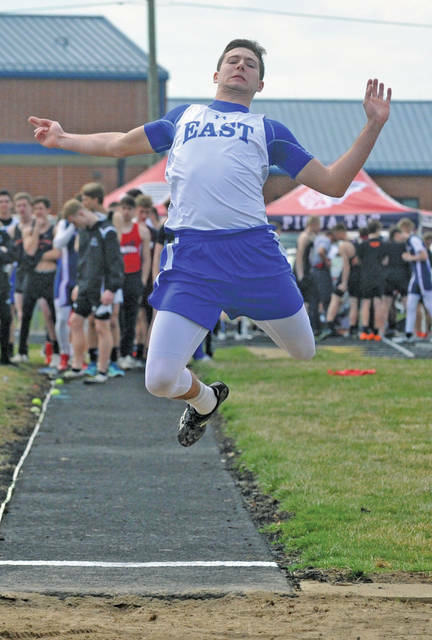 https://www.dailycall.com/wp-content/uploads/sites/30/2019/04/web1_040519jb_me_justinbrown.jpgJosh Brown|Miami Valley Sunday News Miami East’s Justin Brown competes in the long jump at the Miami East Invitational Friday. 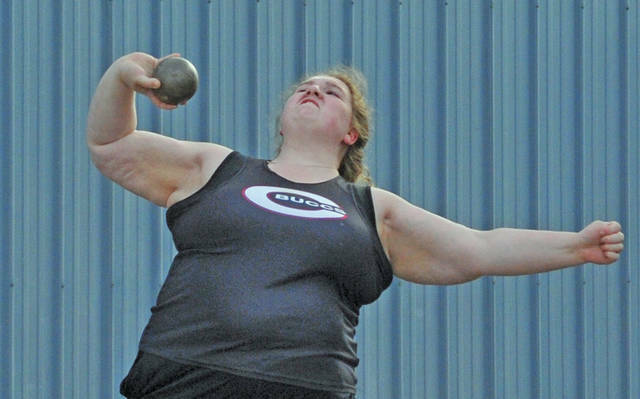 https://www.dailycall.com/wp-content/uploads/sites/30/2019/04/web1_040519jb_cov_laurenchristian.jpgJosh Brown|Miami Valley Sunday News Covington’s Lauren Christian throws the shot put at the Miami East Invitational Friday. https://www.dailycall.com/wp-content/uploads/sites/30/2019/04/web1_040519jb_piq_nicholas_me_hawkins.jpgJosh Brown|Miami Valley Sunday News Piqua’s Camilla Nicholas (left) and Miami East’s Gabrielle Hawkins (right) were first and second in the 100 at the Miami East Invitational Friday. https://www.dailycall.com/wp-content/uploads/sites/30/2019/04/web1_040519jb_mu_morgangrudich.jpgJosh Brown|Miami Valley Sunday News Milton-Union’s Morgan Grudich runs the 100 hurdles at the Miami East Invitational Friday. 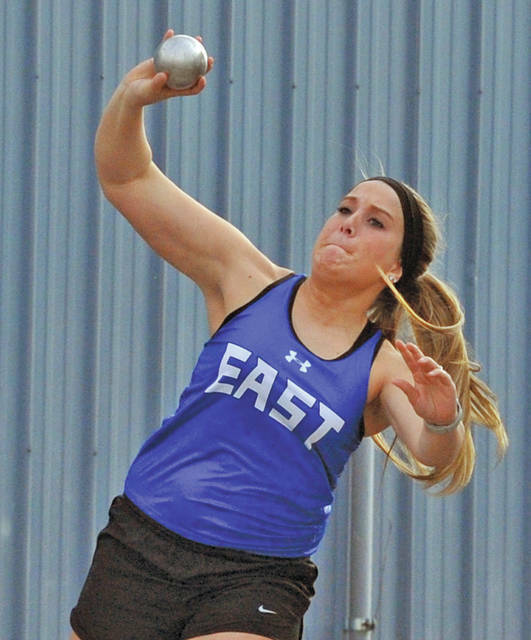 https://www.dailycall.com/wp-content/uploads/sites/30/2019/04/web1_040519jb_me_amberkinnison.jpgJosh Brown|Miami Valley Sunday News Miami East’s Amber Kinnison throws the shot put at the Miami East Invitational Friday. 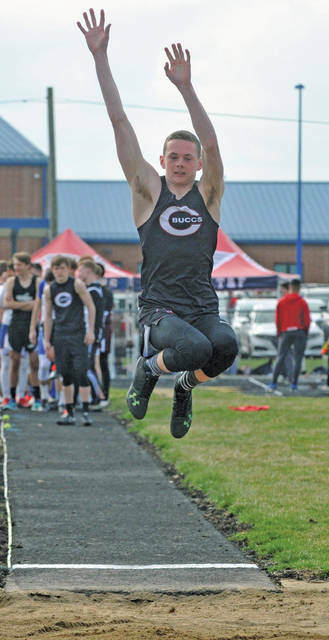 https://www.dailycall.com/wp-content/uploads/sites/30/2019/04/web1_040519jb_cov_kadinpresser.jpgJosh Brown|Miami Valley Sunday News Covington’s Kadin Presser competes in the long jump at the Miami East Invitational Friday.